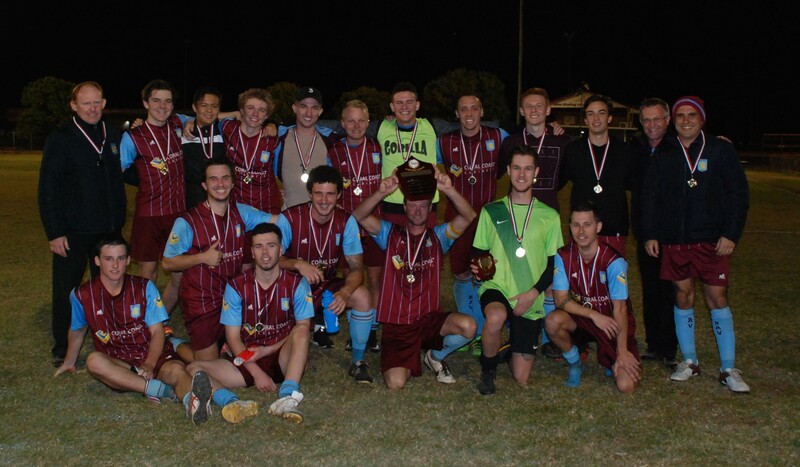 The Brothers Aston Villa Senior Men’s team have successfully defended their title as Wide Bay League Premiers in 2017. The premiership shield was presented to the team in front of their fans at the conclusion of their hard-fought win in the major semi-final on Saturday evening. 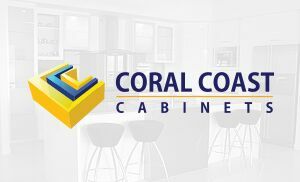 Australia is one of the few parts of the football world where the premiership title is considered of less importance than victory in the grand final, so the team know that there is still work to be done to complete a dominant season in the Wide Bay League competition. 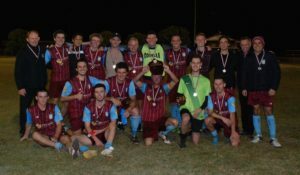 The Villa team ensured their place in the grand final with a tense 2-1 extra time victory over fellow Bundaberg team Bingera on Saturday night. After a scoreless first half of limited chances for both teams, the Villans failed to convert a penalty chance early in the second half. Bingera made them pay less than two minutes later when they converted a well taken free kick to grab the lead. The Villans won another penalty with just over ten minutes remaining, and this time Gareth Jones left the Bingera keeper stranded as he calmly put the ball into the bottom left-hand corner of the goal. Both teams had chances as the clock ticked down, but the score remained 1-1 when the full-time whistle was blown. The physical nature of the match meant that players from both sides struggled during the first period of extra time, as both teams tried to break the deadlock. Early in the second extra time period, substitute Michael Stayte used his explosive speed to beat his defender and send a low cross into the box, and Blake O’Brien arrived at the far post to slot the ball home to send the Villa supporters into raptures. The Villa defence held strong for the final ten minutes of extra time to claim the victory. The team can now prepare for the grand final to be played on Saturday 9 September at Bundaberg’s Martens Oval, when their fans will be out in force to support their team. The next generation of Villa players will also be on show when the Under-16 team plays in their grand final next Saturday at 1pm.